The Nerf Super Soaker Clip System Canisters are extra reservoirs compatible with a number of the new Super Soaker models released for 2011. Apparently, they can hold rougly 275 mL (~9oz.) of water and holds its contents securely until attached to a blaster. For all intents and purposes, the Nerf Super Soaker Clip System Canisters are a throwback to the late 1970s and 1980s when many water guns on the markets were modeled after real weaponry and employed removable magazine that held the blaster's water. Unlike the earlier models, this version of a magazine reservoir offers a screw cap enclosure and does not leak if left lying on its back or side. Hasbro spent some time at doing some nifty engineering to make this work. These magazines, themselves, do not pressurize, thus can only be used with blasters that offer either a separate pressure chamber or those that simply draw water from the reservoir, namely piston-based and motorized blasters. 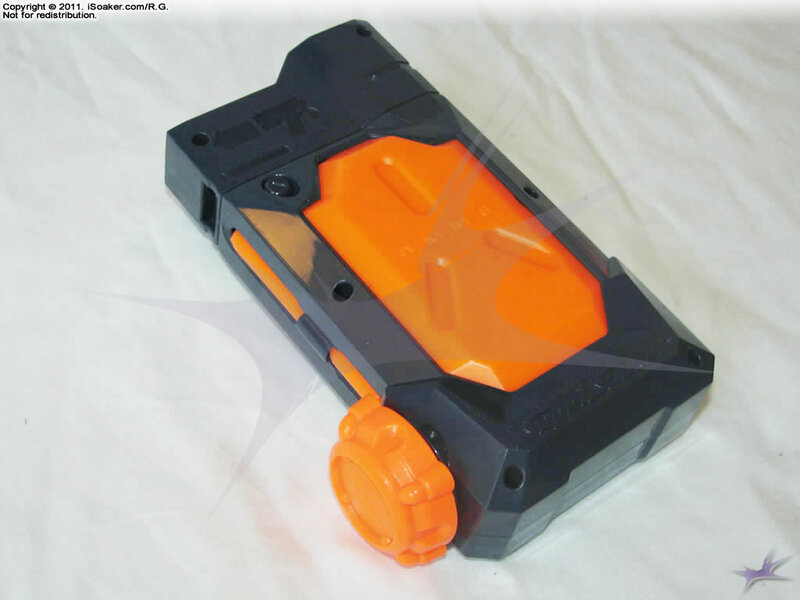 Presently, there are two Nerf Super Soaker models that can make use of these interchangeable magazines: the Super Soaker Thunderstorm and the Super Soaker Tornado Strike. It is a little surprising that the Super Soaker Scatter Blast was not made compatible with this system while it is understandable why the Super Soaker Hydro Cannon did not use it as each of the Hydro Cannon's blasts would require a magazine swap afterwards. These Clip System Canisters come with a belt clip for allowing a user to carry extra clips without need for additional equipment. Within each clip is an intake tube that runs from the top of the clip to the base of the reservoir portion, allowing most of the water to be used. One definite benefit to these clips is that their small size allows them to be quickly refilled from most water sources when holding the whole blaster may not be possible. Their limited size, however, also means limited soaking potential. 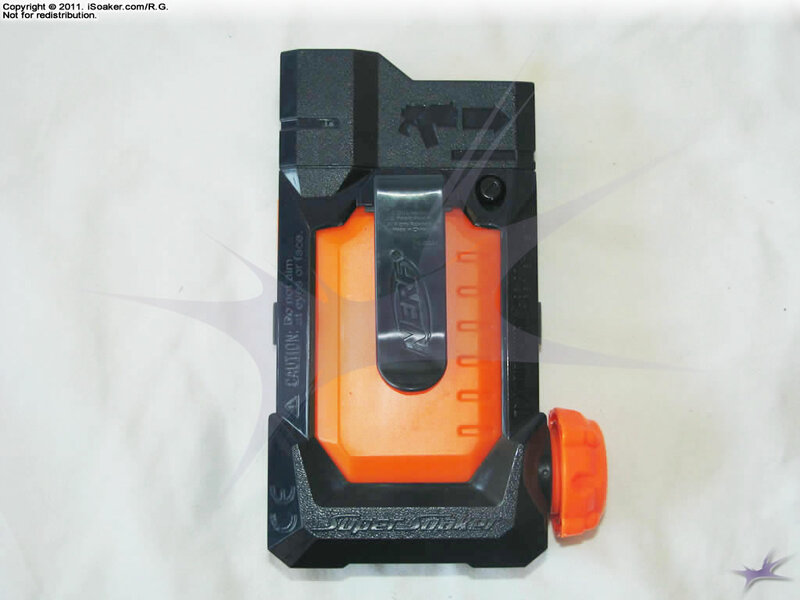 Overall, the Nerf Super Soaker Clip System Canisters are well-made accessories that allow these magazine-compatible blasters to have access to additional water in the field. The fact that they only release water when attached to the blaster is nice, but their limited capacity means limited overall soaking opportunities. As well, with only two water blasters in the Super Soaker line compatible with these magazines, the thought of being able to share magazines with one's allies becomes much more limited. Sturdy build; leak proof design. Easy to attach and detach from compatible water blasters. Belt clip allows multiple magazines to be carried without need for bags or additional equipment. Small size makes refilling easier from most water sources. Capacity on the low side meaning limited soaking potential. Presently only two not-too-powerful water blasters are compatible with these magazines.